Daisy the Curly Cat: Happy President's Day! In honor of President's Day today, I have a couple of special jokes for you. Are you ready? Question: What did George Washington, Abraham Lincoln, and Christopher Columbus all have in common? Answer: They were all born on holidays! Question: Which President had the biggest family? Answer: George Washington. Because he was the father of our country! Hahahaha! I crack myself up! I never realized President's Day could be so much fun. Haha those are cute jokes Daisy. Hope you had fun at Mount Rushmore! Happy President's Day to you Daisy, and to Harley as well. Have a nice presidents day Miss D. Do your beans get the day off today? Hahaha that is funny Daisy. You make a good addition to Mount Rushmore. Happy Presidents Day! Thanks for starting our Monday with a smile. We really loved that last photo! We need to put you in as President Daisy. I bet there would be all treats and no foolish spending !!!! You are one funny girl, Daisy! Hahaha! We thought the lickety-pic was the most fun! Thanks for the morning laugh, I like your jokes! You are so funny, Daisy! HeeHee! You crack me up too! I can totally see you on Mount Rushmore, Daisy! Thanks for waking me up with a smile, and have a fab day! Hahaha! Thanks for the laughs today, Daisy! That is SO funny Daisy!! I love your jokes and Momma tells them to everyone! And what a great picture of you at the end...um, did you snort when you laughed?? I do that sometimes. Thoze were no only vary funny jokes, but yoo did a good job of telling them. Maybey yoo need to be a standup comic! Ha ha ha, Daisy, you crack us up!!! I laughed out loud when I saw you on Mount Rushmore. You looked good up there! Very stoic. Good that you were not sticking your tongue out in that one. Oh, and I liked your jokes too. Have a nice Presidents Day! You get cuter every day!!! Good jokes, cheers to daisy!! PS: Mommy needs more coffee, she is mistyping things again. I can not tell a lie...those are funny jokes, Daisy! kisses for you and Harley! Daisy, you crack us up too! We like starting the day out with jokes ... hee hee! My mom has never been to Mt. Rushmore, but now she REALLY wants to go! Happy Presidents Day Daisy and Harley! We ♥ your ♥-shaped tongue, Daisy! Happy President's Day! I hear it's pretty good when you can laugh at yourself! I like President's Day because my mom is home with me. You crack us up too! I think you look just right on Mount Rushmore! Of course we didn't guess the answer to the joke.. Happy Monday to you and Harley! Thanks for the jokes. I'll enjoy them. Hee hee! Funny jokes, Daisy! And you make a great President. And we like how you can make your nose disappear. Very talented and beautiful! Lovely blog, I love cats! P.S. Concatulations to the Grand Prize Winner, Harley! thank you for the great jokes! i can't wait to tell them to my friends. hahaha! Daisy, we didn't notice that you were on Mount Rushmore the last time we were there! Daisy,you crack me up too. Happy Presidents Day. Daisy you made us laugh! You are so silly sometimes. Hahahaha...daddy calls dem kinda jokes "groaners". LoL that is so funny!!! 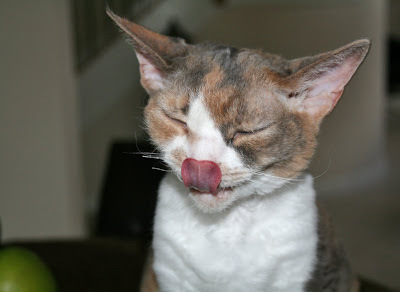 Devon Rex look like a cool looking cat breed. 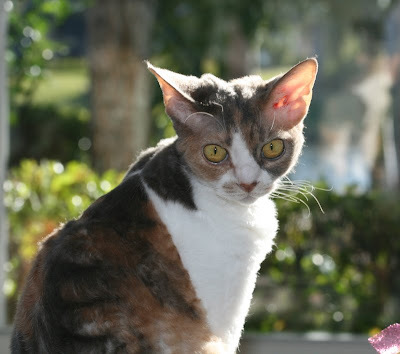 wish to find anybody in Malaysia that keep devon rex breed. The best thing about President's Day is the terrific sales that the stores have!!! But we live in England now and they don't celebrate PD over here. Go figure. Happy President's day, and congratulations for the first Président's Womancat!! Daisy, you are just too funny! Happy President's Day. Daisy, you are a very funny cat and your photo looks good anywhere! Ha ha! We definitely think you should be on Mt Rushmore. You make it super cute! Woo are soooo furry khlever! She's a fashionista, she's a supermodel, she's a comic, she's a stripper (see Daisy's Valentine to Skeezix) - you is one talented kitteh! AHAHAHAHAHAHA! That is the sound of me laughing very hard at your pretty face on Mt. Rushmore. I have to say, that was funnier than your jokes. Hehehehehehehe!!! Those were very funny Miss Daisy!!! Happy President's Day to you, too! Those were funny jokes! And I loved you on Mt. Rushmore. Happy Presidents day to you too! You look great up there next to GW! ha ha ha! those are great! Hey, I have one too. What was the last thing George Washington said before he and his men got in the boat to cross the Delaware River? "Men, get on the boat." Har! What a great monument to a great kitty! Very appropriate, I say. hiya! Just watched Daisy's circus tricks... Fantastic, I loved it! Happy Presidents' Day to you, Daisy and to Harley too. Hahaha I luv that last pitcher of you Daisy! You look very happy with yerself! Oah I just love thes first one~! Good ones Daisy, we need a laugh to day. Daisy yoo is furry funny! We love yer jokes!! Those are great jokes, Daisy. Happy President's Day. You look great up there on Mount Rushmore! They were funny, And Daisy I love, love love that final pic of you! ohhh me like you jokez!! mai mom say it is cutez!! me lik eyour last photo where u smiling! 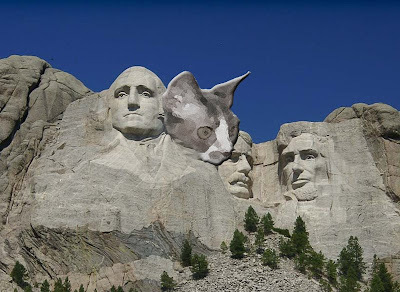 Nice job on Mount Catmore. Heh, heh. Oh Daisy, you're a card!